This grammar is likely the fist to appear with its own drinking cup. 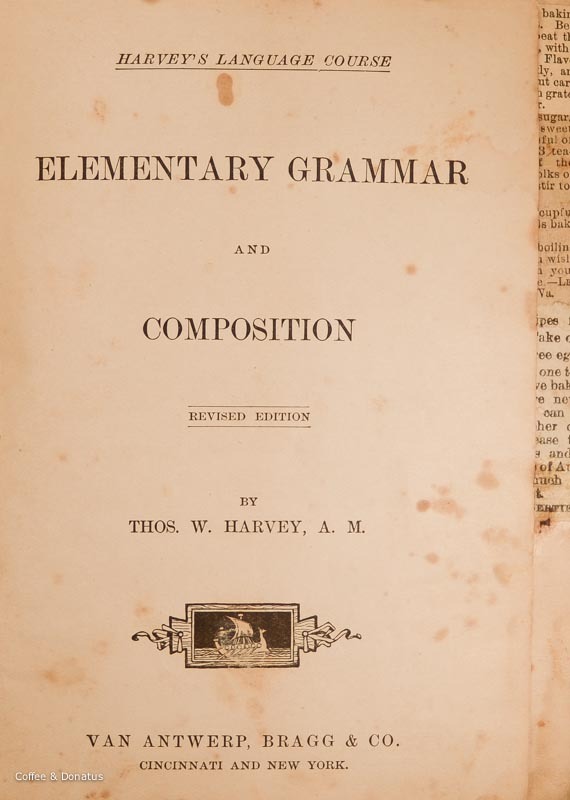 I recently stumbled across an unusual copy of Thomas Wadleigh Harvey’s Elementary Grammar and Composition.The book has been almost entirely repurposed, with the text obscured by newspaper clippings of recipes and remedies that look to be mostly late 19th century. Recipes for all your old favorites can be found in its pages—mush, corn pone, doughnuts in rhyme, Philadelphia puffs, cod balls, and of course, excellent white bread. The book also includes several handwritten medical remedies, including the long-lost cure for small pox (prevents it too) and a general “cure all” for anything else. A few pages of the grammar remain, so all is not lost for the student hungry for a parsing lesson or two. Be sure to see all the images in the gallery. A little conical paper cup has also been folded flat and loosely inserted. 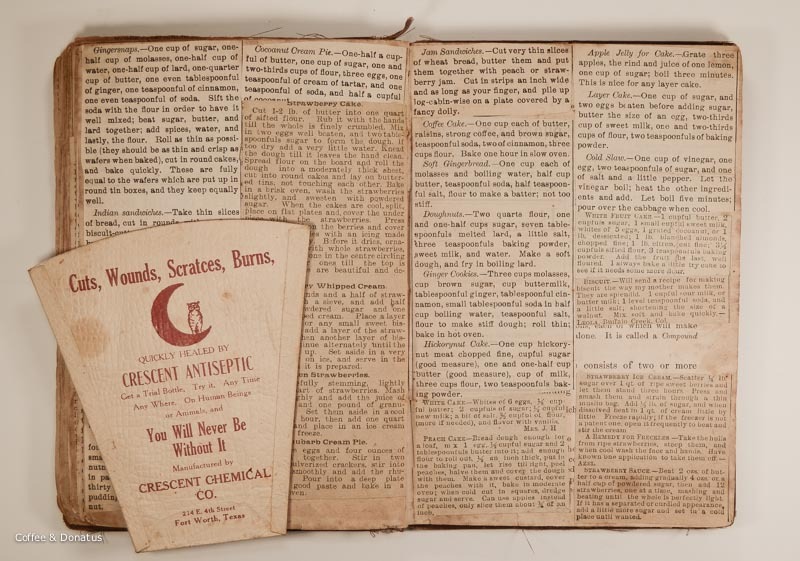 It’s printed with an advertisement for Crescent Antiseptic (good for cuts, wounds, scratches, and burns). I believe it’s the first grammar book to come with its own drinking cup— an innovation I’m sorry to say has not managed to survive to grammar books of our own time. 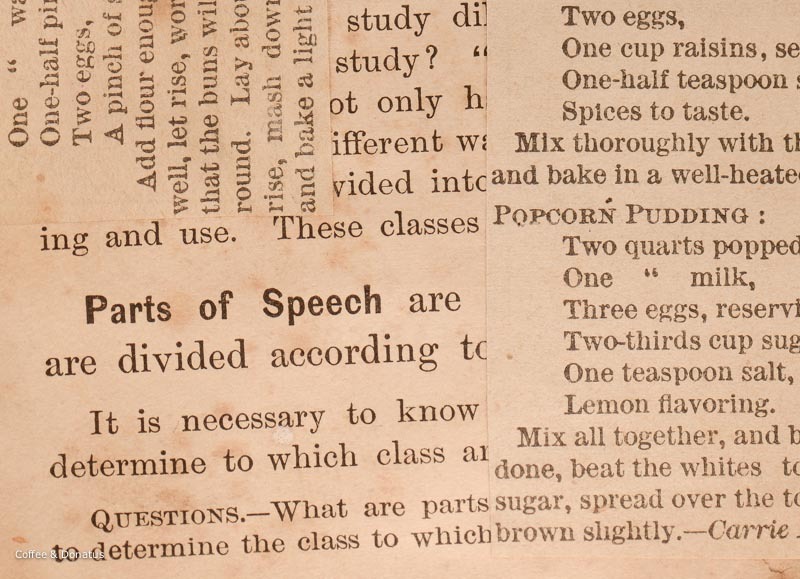 A delicious collision between the parts of speech and popcorn pudding. “C. M. Hopkins Druggist” is sloppily stamped in faded purple ink on the front free endpaper. I’ve discovered that Dr. Hopkins was from Wall Lake, Iowa where he practiced medicine for a time, went on to become the coroner of Sac County, and apparently spent his golden years in the “implements business” (whatever that is). Ironically, his death notice appearing in the July 5th, 1901 edition of the Lake View Resort’s News & Vital Statistics, has him dying of blood poisoning. Curious readers should heed the warning and give up any notion of trying the medicinal concoctions at home. 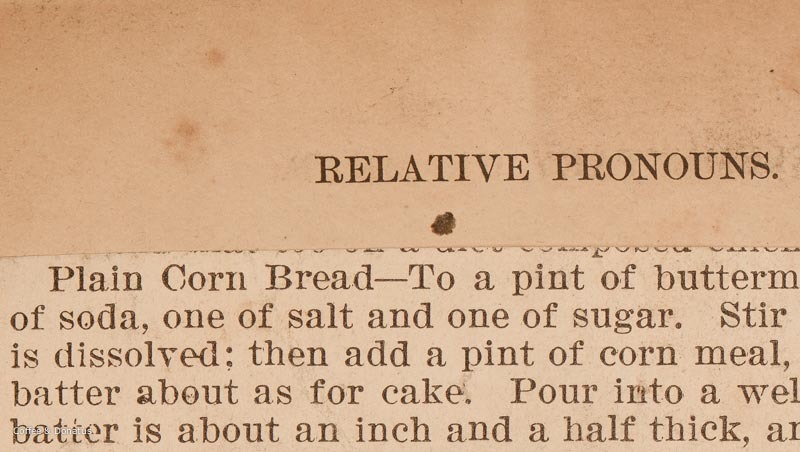 Relative pronouns are are apparently best enjoyed with plain corn bread. Thomas Wadleigh Harvey was the author of a number of popular English grammars, reprinted up through the early 20th century. First published in 1869, the edition here is the first revised edition, published in 1880 (Gorlach 805). It includes the additional series title Harvey’s Language Course. Aimed at a juvenile audience, the book contains a number of illustrations— all of which are papered over in this copy. The last 19th century edition appeared in 1897 (New York, Cincinnati: American Book Company). 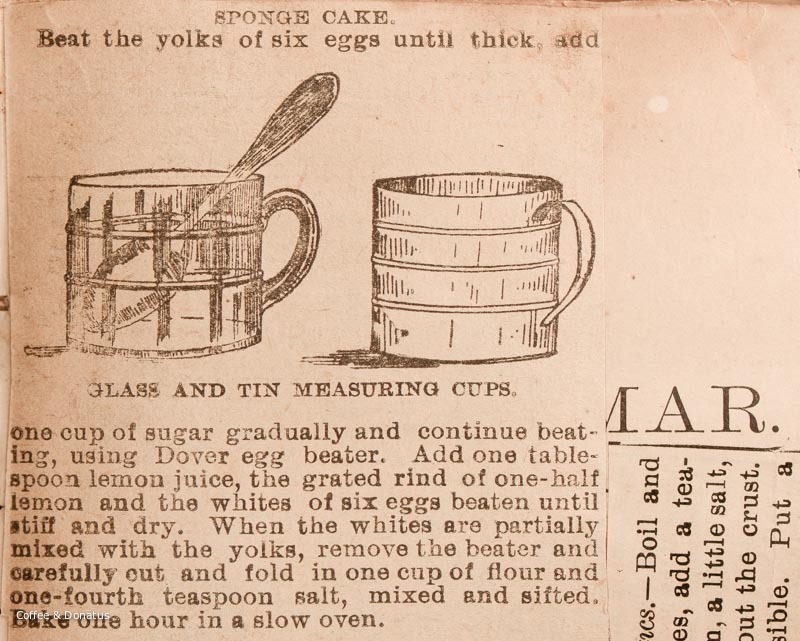 A recipe for sponge cake with helpful illustrations of glass and tin measuring cups. Cincinnati, New York: Van Antwerp, Bragg & Co., Eclectic Press, copyright 1880. 63 leaves remain, some appear to have been torn out (perhaps used as a napkin).